Thank You Chef Laurent Quenioux! Many thanks to our friend Laurent Quenioux. He recently posted this instagram photo of uniforms for his London popup. 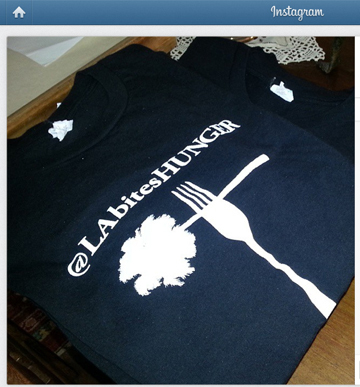 We are so honored that his team will be wearing @LAbitesHunger shirts during the day shift! Check out details on his London dinner series here. The popup is scheduled through 11/14/13. Chef Laurent Quenioux on twitter. L.A. Bites Hunger on Flickr.